Brighten your life with OFM’s Essentials ESS-9003 LED Lamp Collection. 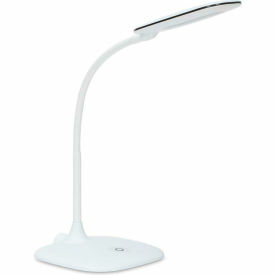 This desk lamp provides 420 Lumens and creates a contemporary accent for your home office, dorm room, or workspace. This lamp has a height of 16" and can extend out 12" from the center of the base. This lamp is a no fuss, no bulbs required LED light that only consumes a fraction of the power, only 6.5 Watts, and the color temperature is 5000 Kelvin providing amazing white accents. This gooseneck lamp has a flexible design that will allow the lamp to go in any direction seamlessly. The touch control lamp allows for over 20,000 hours of illumination, and the soft touch on and off switch, allows the lamp to transition between 3 levels of brightness. This lamp comes in black, white, teal and gray.